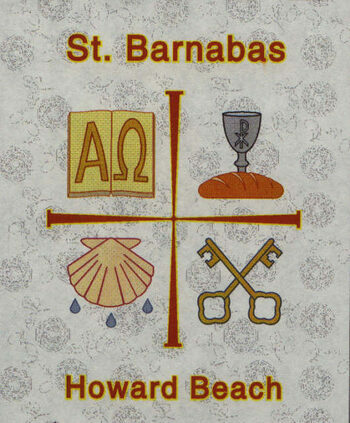 Pictured here is the distinctive symbol of Saint Barnabas Church. Representations of the Word and Sacraments are located within the four corners of a cross formed of crucifixion nails. The open Bible is pictured in the upper-left. It shows the Greek letters alpha and omega which refer to Jesus Christ as the beginning and the end of all things (Revelation 1:8). In the upper right-hand corner the bread and cup of Holy Communion are displayed. The chi rho — the first two letters in the Greek word for Christ — are inscribed upon the chalice. The Keys to the Kingdom — representing Confession and Forgiveness of sins (John 20:23) — are found on the lower-right. And on the lower-left, three drops of water falling from the baptismal shell call to mind Baptism in the Name of the Father, the Son, and the Holy Spirit.